Sometimes it is important to deal with a broad subject through a series of sermons. You know that one sermon is not sufficient to cover the subject or topic properly. So, a series of sermons is the best way to go. However, there are two important rules you need to keep in mind when putting together a series of sermons. First, the series of sermons need to be brief. Congregations often lose interest if a major theme is presented over an extended period of time. Second, the series of sermons should show order and progress. You need to plan your sermons carefully so that the congregation can see the relationship between the messages. A haphazard arrangement of related sermons generally will not be as effective as a series that has order and progress. You want to heighten the interest of the congregation as you moved toward a climax in your final sermon. First, you will need to develop your broad subject or topic. Recently, I preached a series of sermons on spiritual warfare. I wanted the congregation to understand what was required to win the spiritual battles that they faced in their everyday life. So, my broad topic was: Winning the Spiritual Battles in The Christian Life. Once you have the broad subject sorted out, you will need to put together several sermons to cover the subject properly. As I had preached many sermons on this topic prior to the series, I simply collated some of those sermons in a cohesive and sequential order. In the end, I decided on four sermons. They were: knowing the enemy, preparing to meet the enemy, standing against the enemy and praying against the enemy. I developed these sermons mainly from the passage of Scripture in Ephesians six. I felt that if we were to win the spiritual battles in our lives, then we first need to know our enemies. Once we know our enemies, we can prepare, stand and pray so that we can win those spiritual battles we face in our Christian life. I wanted to preach a series of sermons on the victorious Christian life. So, I simply called the series: The Victorious Christian Life. Once I had chosen the broader subject, I started to put together some topics that were relevant to the series topic. I decided on the following: The Power of Faith, The Power of Forgiveness, The Power of Love, The Power of Giving and The Power of Prayer. There were so many topics that I could have put into this series of sermons; for example, there was The Power of Suffering, The Power of Perseverance, The Power of Hope, The Power of Sacrifice, etc. etc. However, I needed to remember the first rule for a series of sermons, which was keeping the series brief. When it comes to a series of sermons, you simply need to choose a broad subject and select a number of sermons to expand and explain the chosen subject. In many ways, it simply comes down to your creativity. The Bible has many broad subjects from which you can choose. How To Write a Sermon: Homiletics is the art of preaching. 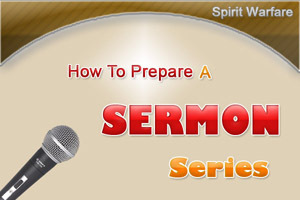 It involves how to prepare and deliver a sermon.